MR. NOFACE'S SHRUG LIFE: Little White Lies. Remember this girl? Her name is Bethany Storro. 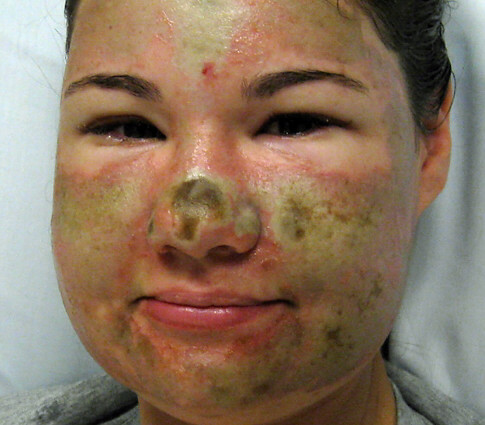 She is the young woman whose face was burnt as a result of an acid attack. She claimed that a twenty something black woman with her hair tied in a pony tail was the one who threw acid at her face after saying "Hey pretty girl, do you want to drink this?" These turn of events of course, drummed up a lot of sympathy for Bethany (she even was was to be interviewed by Oprah). That is until folks started to find some inconsistencies with her story. People started asking questions and she would suddenly be unreachable for comment (she even cancelled on Oprah). It turns out that Ms. Storro's story was inconstant because it wasn't true. That's right folks, she made the whole thing up and like the backwards "B" chick she mutilated her own face and blamed it on a black person. *Sigh* Why is a black person always the assailant chosen when it comes to white women making up crimes against committed them? Why does it seem natural for people to assume that all black people are violent criminals waiting for an opportunity to attack white people? These are rhetorical questions, I already have my answers. I know how race in America works and I also know that things probably won't change significantly, any time soon. I just wish that situations where a white woman (because it is usually a white woman making these accusations) is caught in her lie, would be a lesson to America spurring us to have a more critical eye focused on these kinds of accusations. I'm a realist however, and I fully prepared for this, like a ninth page retraction to a front page declaration, to not even make a dent (the damage already being done). Or the Black people who kill white women's babies. It seems that "Black" is the default for violence. Black is the default for everything negative. The result of hundreds of years of overt and subliminal indoctrination. I'm just tired of there not being a deeper race discussion coming about when these lies are discovered. This was a similar set-up in Milwaukee some years back. The LA Clippers hat was a nice touch on Anderson's part, because what doesn't scream violent black criminal more than a LA Clippers cap. I remember that case (vaguely) and the white outrage that bore down on this phantom assailant before the truth came out. I also remember the "oh well, mistakes happen." attitude that the main stream had towards the effect Anderson's lie had on the black community after his lie was found out.